Launching on February 15th, Clinique’s Chubby Sticks for Eyes look set to be every bit as wildly popular as their lip products. They’re incredibly appealing, with their twist-up chunky crayon shape and pretty colours, and there are 12 to choose from, with a good selection of neutrals, pastels and deeper, moodier hues. 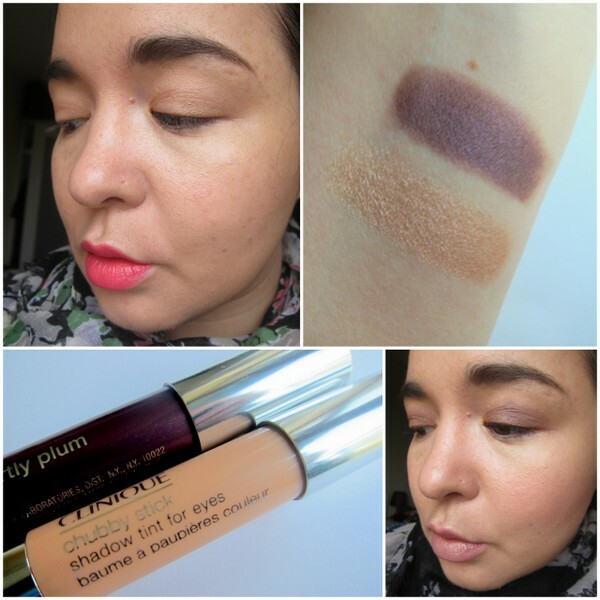 I was given Portly Plum and Bountiful Beige to play with ahead of the launch date. Both shades give a soft, semi-sheer wash of colour all over the lid – don’t be worrying about precision here, just draw it on and smudge it out with your finger. Simples! With their soft and creamy textures, they glide on and blend like a dream. The shades are designed to be worn alone or together, and you can layer ‘em up for a more dramatic finish if you’d like. Best of all, they’re absolutely foolproof - they’ve really streamlined my routine, saving me precious minutes in the morning. They’re perfect for on-the-go or when you’re in a rush, and they last without creasing throughout the working day. Pricewise, they’re not the cheapest at €22 but, like the Chubby lips, I’d say they’ll last forever. Whopping Willow – a gorgeous khaki shade – and Ample Amber are the next two on my list. What do you think, will you be checking them out? Looks foolproof. I love the plum shade! beautiful! love the darker color! soo pretty with the sheer wash.
Oh god now there's more things I need to buy! It looks so goooood! This is so exciting to hear, the chubby sticks are far easier to apply and fuss free, love these two shades. That plum colour looks very nice! i've been waiting for this! they look really good emma. What a fun concept and the plum color is gorgeous on you! These look great and I love the colours!! I'm a huge Clinique fan - I'll be first in line for these babies on 15th. Lovely colours on you, Emma. Ohhh bountiful beige looks lovely! Looks foolproof indeed :-) I am just not too crazy about these two shades. How fun! And foolproof? Right up my alley! wow they look really nice. you are right. the price is pretty steep. I so love the plum shade. It is so beautiful.